Tsum Valley Trekking is a sacred Himalayan pilgrimage valley situated in a trans-Himalayan region of Gorkha, Nepal. The Tsum Valley's acquaintance with Tibet, natural beauty, and its pristine culture make this trekking unique. Tsum comes from the Tibetan word 'Tsombo', which means vivid. Against the majestic backdrop of the Ganesh Himal, Sringi Himal and Baudha Himal ranges, this serene Himalayan valley is rich in ancient art, culture, and religion. The local people are mostly of Tibetan origin and seek a unique dialect. Trails are strewn with artistic chortens and lined with mani walls made of thousands of stone slabs carved with deities and prayers. The Tsum valley trekking has a long history of Buddhism. The Buddhist saint Milarepa is believed to have meditated in the caves of there mountains. Traditionally Tsum valley was a culturally distinct geographical area called 'Tsum Tso Chuksum', which means thirteen provinces ruled as a single territory. The ancient remains of the Tsum Kingdom are still visible today. Due to its remoteness and inaccessibility, this sacred valley and its people have been bypassed by mainstream development for centuries. As a result, the unique culture of this valley has remained intact. Tsum Valley trek ascends follow Buri Gandaki River. Tsum valley trek (part of the Inner Himalaya) is hospitable local people (Tibetan group "Tsombo") welcome you with traditional Tibetan Chiya (butter tea) and local meal. The Tsum Valley is extremely rich in cultural assets. The valley is dotted with gompas (Buddhist monasteries), Chortens and mani walls. The longest mani walls (over 250m) are at Dzong and Phurpe. The valley preserves steps of the great Buddhist Yogi Chyuchin Milarepa and story about Guru Padmasambhava Circumbulation. The people here never slaughter animals, even as a sacrifice to the gods. Tsum Valley Trekking is surrounded by the Buddha Himal and Himal Chuli to the west, Ganesh Himal to the south, and Sringi Himal to the North. 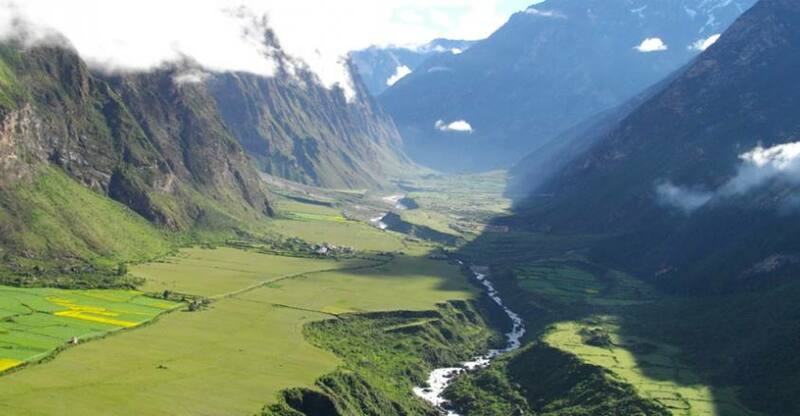 Halesi Treks well organize the Tsum Valley Trekking. The attractive views of Himalchuli (7893m. ), Manaslu 8163m, Ganesh Himal, Ngadi Chuli (7879m.) or (peak 29), Sringi Himal and other mountains, beautiful varied landscape, and different flora and fauna and wonderful. This part is also incomparable beauty and rich blend of Tibetan and Nepalese culture offer a true adventure for visitors to Nepal. Here you will find the mountains and valleys covered with diverse and pristine eco-systems. Day 01: Arrive Kathmandu & Transfer to Hotel (1,300m. Day 04: Soti Khola to Maccha Khola (870m.) 6-7 hours. Day 05: Maccha Khola to Jagat (2340m.) 6-7 hours. Day 06: Jagat to Chisopani (1660m.) 4-5 hours. Day 07: Chisopani to Chumling (2,386m.) 6 - 7 hours. Day 08: Chumling to Chokhangparo (3,010m) 4-5 hours. Day 09: Chokhangparo to Nile (3,361m.) 5-6 hours. Day 10: Nile to Mu Gompa (3,700m.) 3 hours. Day 12: Mu Gompa to Burgi Village (3,245m.) via Milarepa cave: 5 hours. Day 13: Burgi village -Chumling (2,386m.) 5-6 hours. Day 14: Chumling to Philim (1,570m.) 6-7 hours. Day 15: Philim to Khorlabesi(970m.) 6-7 hours. Day 17: Soti Khola to to Kathmandu drive 7-8 hours. Day 18: Departure from Kathmandu. Airport / Hotel /Airport pick up and drop by private vehicle. (Breakfasts, Lunches, and Dinners with Tea, coffee, hot chocolate. Licensed holder English speaking guide. The required number of local porters to carry your luggage and camping equipment during the trek. Food, accommodation, salary, insurance, equipment, and medicine for all staff. Special Manaslu Tsum Valley trekking permits and other entry fees. From Kathmandu / Sotikhola Kathmandu by 4WD Jeep or private Bus. All our government taxes, Tourist service charge and Vat. 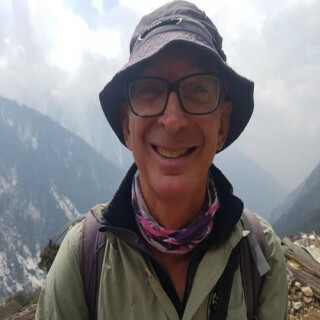 arrival in the Tribhuwan International Airport (TIA) in Kathmandu, we will be greeted by a representative from Halesi Treks will drop at your hotel. Overnight in Kathmandu. you can do city sightseeing or rest at the hotel. In the afternoon, there will be a pre-trip discussion where we can meet our trek leader and other team members. Overnight at Kathmandu. 7-8 hour's drive from Kathmandu into the western mountains. Through the dirt road from Dhadingbesi viewing the greenery hills, we reach Sotikhola, our trek start point Sotikhola is a major town in the region and is divided into two parts with the Budhi Gandaki river flowing between them. Overnight at Tent camp. Cross the bridge and trek through the beautiful Sal forests, then climb onto a ridge above huge rapids on the Budhi Gandaki. The rocky trail then weaves its way up and down, past two tropical waterfalls on a steep, rocky trail clinging to the side of a cliff. It eventually makes its way down and past a few rice terraces, then up and around to the Gurung village of Labubesi. Overnight at Tent camp. we climb over a rocky ridge to Salleri and then descend to Sirdibas. The valley widens a bit as the trail continues to Ghatta Khola. Continue upstream to a long simple hanging bridge. Climb up to Philim, a large Gurung village. Philim valley is well known for Japanese made school and police station. Walk past Philim to the north across a forest with the views of the narrowing valley we reach Chisopani. Overnight at Tent camp. After Ekle Bhatti cross the gorge and half an hour walk on the right side we get to see the big and beautiful waterfall and enter the pine tree forests. Descend down to the trail going to the Tsum Valley. Climb through pine and rhododendron forests. Enjoy the views of Himalchuli mountains at 7893m and Boudha Himal from Lokpa, a small beautiful village. Overnight at Tent camp.
. Cross the suspension bridge onto the opposite bank. Enjoy the great views of Ganesh Himal. Walk past Rainjam to Serpu Khola crossing another bridge we arrive at the Gho Village. Another continues 2 hours climb to Tsum takes us to the village of Chhokangparo. Weather permitting; enjoy the views of Himalchuli at 7893 meters and Ganesh Himal at7140m. Overnight at Tent camp. climbing above Chokhangparo, better to be careful of altitude problems. Walk past Lamagaon crossing rope suspension bridge to the Rachen Gompa, which is also well known as Nunnery Gompa too. We make a small visit and then we cross the Shiar Khola. Continue walking through the well-managed villages Lar (micro hydropower), Phurbe and Pangdun. Leaving old historic Stupa of Buddha in a way crossing the village of Chhule, climb upstream and cross the bridge to finally arrive at the Nile.Overnight at Tent camp. We are now almost close to the Tibetan border. Walk to the west bank of the valley through the Tibetan landscapes. Climb up to the Mu Gompa. We also visit the monastery. Then after, we make a visit to the Dhephu Doma Gompa. Overnight at Tent camp. Today we make a hiking whole Mu Gompa Region. Mu Gompa is the largest monastery in the region. Gompa lies at the highest and most remote part of the Tsum Valley. After exploring the Mu Gompa area. Overnight at Tent camp. Trek back through Chhule and Phurbe, on the east bank of the Shiar Khola. Finally, we arrive at Burgi village. The Burgi village is a small beautiful village. Climb up to the Milarepa's Cave Milarepa Cave (piren Phu) Overnight at Tent camp. trekking watching the greenery of nature and descend down to Chhokang Paro again. From their continue descending to Gho. Descending further, we arrive at the bridge over the Sarpu Khola. Overnight at Tent camp. The trail continues to Lokpa. After lunch south on a flat trail, we move ahead. Enjoy the gorgeous Samba Falls. Overnight at Tent camp. Trek starts today from Philim to Khorlabesi via Jagat and Tatopani. Descend down to Sirdibas and we finally reach to Jagat. Further descend takes us to Yaruphant. The arid Tibetan climate now gives way to subtropical green vegetation. Continue trekking to Dobhan. Finally, arrive at Tatopani. There is a hot spring at Tatopani. If interested, you may dip yourself in the hot spring and relax your tired muscles by soaking yourself in the hot spring. If not continue walking up and down from Tatopani to reach Khorlabesi. Overnight at Tent camp. The trail crosses the Tharo Khola flowing in a rocky ravine. Head down again to the river and traverse to Machha Khola village. Walk along the Budhi Gandaki River to reach to Gurung village of Labubesi. Pass the two waterfalls on a steep rocky trail on the side of a cliff. We then reach Khursane. Walk along the ridge above Budhi Gandaki and cross the Sal forests. Cross the bridge to arrive at Soti Khola. Overnight at Tent camp. Drive Back to Kathmandu along the banks of the Marsyangdi and Trishuli rivers with splendid views of green hills. Overnight in Kathmandu. The flight back home, we will drop to the airport. Effettuato questo trek nella seconda metà di marzo con temperature buone a parte la notte nelle zone più alte. Il gruppo era composto da 6 persone con Niru come guida, Ram assistente guida e tre portatori. I servizi dell'agenzia e delle guide sono stati ottimi, persone competenti e piene di attenzioni alle necessità del gruppo. Tra cui le salviette calde per la pulizia delle mani prima della cena, il gel antibatterico, la frutta dopo cena e il formaggio come antipasto. Si sono sempre prodigati per il servizio delle pietanze e non di rado anche nella preparazione in cucina. Quindi tra tutti noi si è creato un buon affiatamento che ha contribuito alla buona riuscita del trek. La prima parte del percorso si svolge su una strada in costruzione (in comune con il Manaslu Circuit), meno interessante rispetto a quando si entra nella Tsum Valley vera e propria. Poi il panorama si apre su ampi pascoli, villaggi e montagne innevate, con la possibilità di raggiungere alcuni Gompa. The below-given cost is per person and the below-given Tsum Valley Trekking fixed departure dates are available for you. If the given date is not favorable then please contact us and we will happily customize your trip on dates more appropriate for you.